Late June and the coast path around Aberdaron is on fire with flowers of all shapes and colour. The sweet scent of trampled white clover, squashed thyme and honeysuckle; smells so blatant that even my insensitive nose could enjoy them. Back home we compared our photos to those in the Wild Flowers concise guide; Tormentil, Kidney Vetch, Bird’s-foot Trefoil, Lady’s Bedstraw. We were unanimous in naming many but opinion was divided on quite a few - should have taken the book with us. 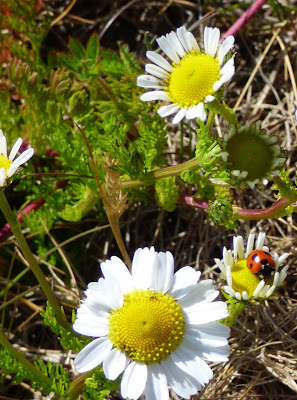 My favourite photo was the ladybird on what I think is Corn Chamomile.